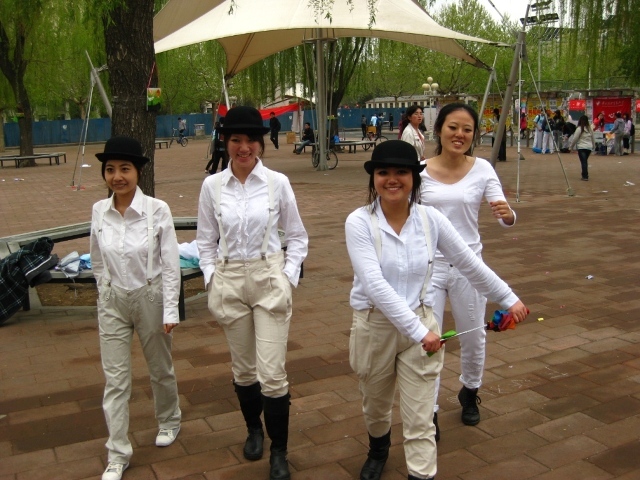 During a rainy April morning in Beijing, a quartet of female college students are in costume and on a mission. 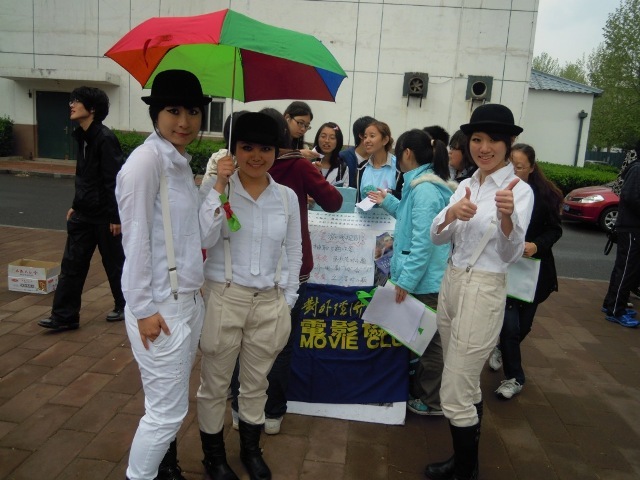 The students, dressed like characters from the iconic 1971 film A Clockwork Orange, are on a recruitment drive for their school’s movie club. The University of International Business and Economics doesn’t exactly seem like a hotspot for ultraviolence or nihilistic shenanigans, but their choice of costume has clearly paid off, as evidenced by the crowd gathering around their information booth. The term “droog”, referenced in the title of this article, means “friend” and was coined by Anthony Burgess, author of A Clockwork Orange. When did you first develop in interest in movies? After I graduated from high school. At that point, I was no longer under so much academic pressure, so I started watching a lot of movies. I watched nearly 100 movies during that time, which opened a fresh new world, full of excitement. Can you name some of the movies you watched during that time? Casablanca, One Flew Over the Cuckoo’s Nest, Dead Poet’s Society. How was this movie club founded? What sort of activities does the club take part in? I founded it with some like minded students a couple years ago. We provide discount local theater tickets to members and hold weekly on-campus screenings. Blockbusters, indie films, Chinese and foreign. How much is a membership in your club? Does the club organize any other activities? Membership is 10 RMB ($1.50) for one year. Recently, we shot a music video and we plan on creating a short film celebrating the 60th anniversary of UIBE. Next month, we’ll hold a movie trivia competition. Which movie provoked the strongest audience reaction? Probably Fight Club. Many viewers were surprised and confused about the ending. American Beauty was also well received. Some viewers got sick after The Silence of the Lambs. Mary and Max was a hit, along with Jia Zhang Ke’s 24 City. Did the audience clap much after those films? Actually, no. Nobody claps after film screenings in China. Usually, clapping is only heard after a leader makes a speech. Which film will be screened next at your school? 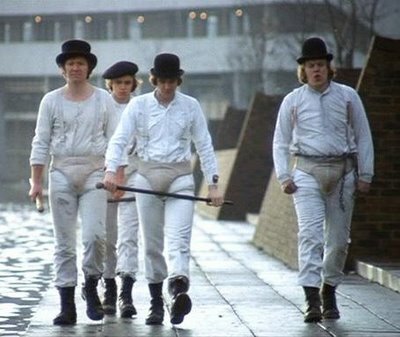 What do you think about A Clockwork Orange? I think the film’s message is that we have the choice to be moral, but we can’t force people to become good. Are there any milkbars in Beijing? No, but there are some juice bars. I’ve never been to one, though. Then how do you get ready before a night of ultraviolence? Viola: Mine is Gone With the Wind. Moon: Amelie. Tim Burton’s Nightmare Before Christmas. I’m a big Tim Burton fan. His films are imaginative and amazing. What kind of movie would you be interested in making? A sci fi movie about a parallel world to our own. Do you ever use IMDB? It’s a big online movie database. Check it out. Which directors are you into? Jia Zhang Ke, Feng Xiao Gan, Christopher Nolan. Can you name some Chinese movies that moved you? What would you say to Alex (the main character from A Clockwork Orange) if you met him? Don’t give up your freedom of choice to be moral. Don’t allow yourself to be controlled. This was written by aleconner. Posted on Saturday, June 4, 2011, at 06:10. Filed under Interviews. 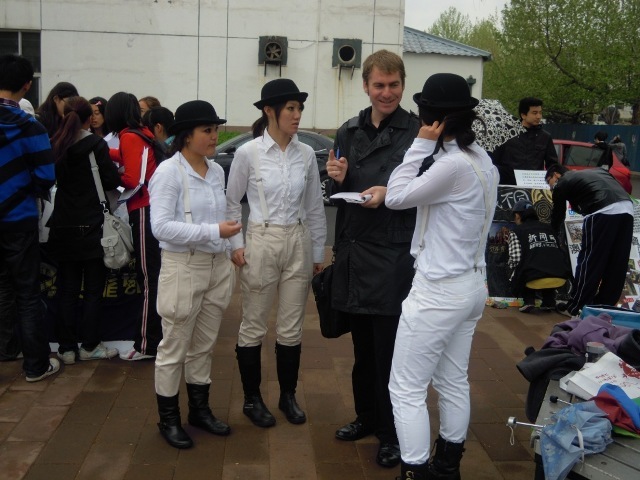 Tagged A Clockwork Orange, Beijing, China, citizen journalism, interview, movie club, movies, public interest, UIBE, vox populi. Bookmark the permalink. Follow comments here with the RSS feed. Post a comment or leave a trackback.